Take A Ride On The Wild Side In Wild Willy a Fully Blow American Gasser #116. Powered By A 460 CI Blown Small Block Producing Over 1450.00 H.P. This Car Was Built In 2010 And Participated In The 2011 Thru 2014 Nostalgia Drag Competition, When On Tour She Will Run a Consistent 9.0 SEC at 160 MPH. This Car Finished Second In The Hot Rod Class Nostalgia's Nationals In Bowling Green KY. In 2014. Since The The 460 CI has been Freshened Up it is a 1500 H.P. Blown Alcohol Donovan Aluminum Small Block done by Boyd Racing Of Norman OK In 2014. In January 2018 It Was Fresh Tuned By Carters Racing of Norman OK, Here Are Just A Few Of The Highlights On This Super Cool Classic. Donovan Aluminum Small Block, Brodix Aluminum Racing Heads, TCI Power Glide Built To Handel The 1500 H.P. 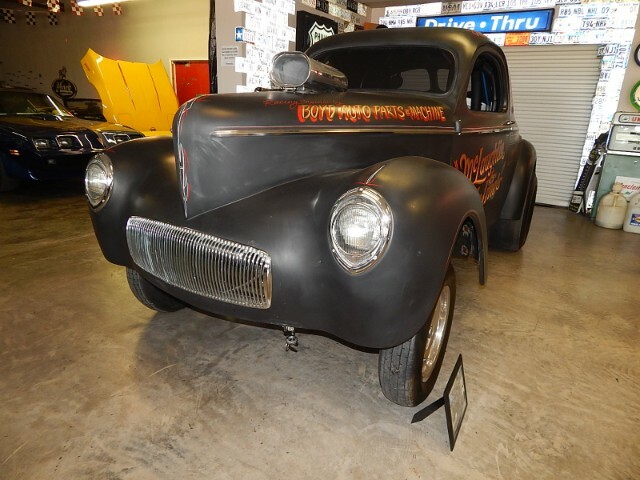 NHRA Rool Cage,971 Mooneyham Blower, American Gasser Stage Three Body And Chassis, Custom Headers, Rodders Custom Wheels, Small Bottle Set Up And So Much More Over 100K Went into it so here is your chance to save a lot of time and money on a turn key car. Call For More Information. Message: Thought you might be interested in this 1941 Willys Coupe. All Payments Shown Are With W.A.C. @ 6.99 At 120 Months Outside Finance Source. Tax, Title, Registration Extra All Texas Residents T.T.L. Due At Time Of Sale. We Offer No In House Financing. See Dealer For Detail.